The beer that got put on the back burner so Ursus could be imbibed was in fact this beer; Dark Island Reserve. From the Orkney Brewery in Quoyloo, North of Scotland, it's whisky aged version of one of my favourite beers; Dark Island. Orkney Brewery took their normal Dark Island ale and matured it in Orkney malt whisky barrels for three months to create the Reserve. With Dark Island having become a regular in my fridge since I first had it, this was a beer that I just had to try. Dark Island should lend itself quite nicely to whisky barrel aging, let's find out just how well now! When this beer was poured I noticed one obvious difference from the normal Dark Island, the head colour! The usual Dark Island has a light cream coloured head, which is quite unusual for such a dark beer. The body of the Reserve looks very similar to the original with a very dark brown body that appears to be quite thin for such a coloured beer. The head retention is poor however and subsequently there is very little lacing. 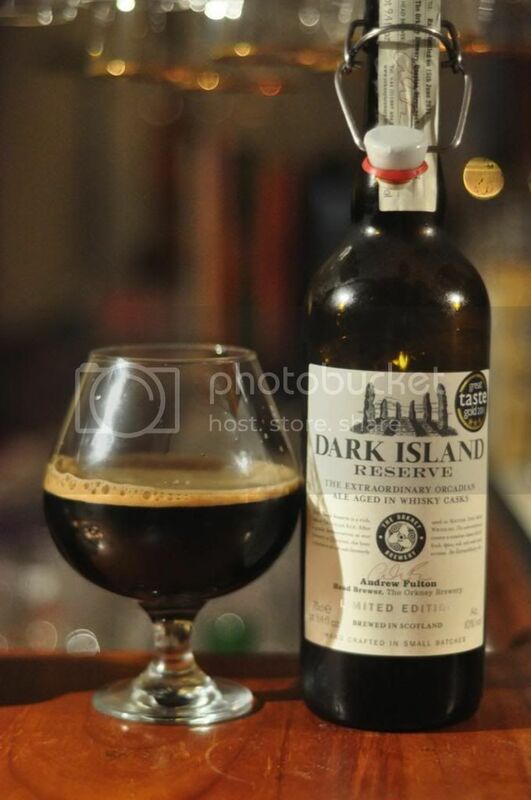 Dark Island Reserve's nose shows clear signs that the aging process has affected the beer substantially. There's plenty of noticeable whisky as well as the peaty aroma that I have become used to in the normal Dark Island, although it is nowhere near as dominant in this brew. There's also plenty of roast and nuttiness on the nose. It's a very enjoyable nose, hopefully it will taste just as good. This is the best beer I've had from Orkney, no doubt! It's strangely complex yet simple at the same time. On the surface it's a nice smokey/peaty ale with hints of whisky coming through. As you look a little deeper there is a lot more complexity to the beer as flavours of molasses, chocolate, vanilla etc. begin to come to the fore. The body of the beer is incredibly thin for a beer that's 10% alcohol and the slightly sticky mouthfeel also seems out of place due to the thin body. This is all semantics though as this really is an exceptional beer! Only 3111 bottles of this beer were produced when they were bottle in June 2011. If you are lucky enough to get your hands on one of these savour it, it's such a sensational beer. It's not a beer that you can drink quickly though and at 10% it's definitely one for sipping on. You have to try Dark Island before sampling this one, as I did this evening, to really see the difference in flavour that three months in a whisky barrel can make to a beer.